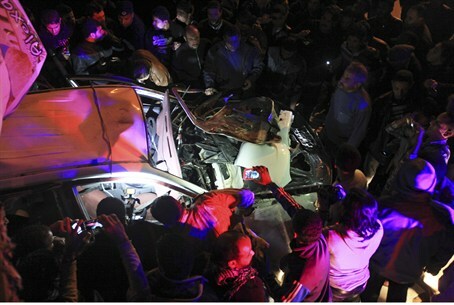 One police officer is dead in a car bombing this week in Libya’s Benghazi, the second such attack in as many days. The city, which gave birth to the revolt that ended the 42-year regime of former dictator Muammar Qaddafi, is rife with terrorist organizations vying with each other for power. At least one police officer was wounded a day earlier when attackers hurled a hand grenade at the patrol car while he was parking the vehicle. That bombing, which occurred Monday, was the latest in a series of attacks on security personnel in Libya’s second-largest city, where radical Islamist terrorists murdered a U.S. Ambassador and three other American diplomats on September 11, 2012. Attacks on properties belonging to the United Nations (UN), the International Committee for the Red Cross (ICRC), Britain and Italy and their personnel have escalated, highlighting the chaos and danger in the area. The Libyan government said it was considering imposing a night curfew in Benghazi. Officials also vowed to create a protective force for diplomats in the wake of gunfire aimed at the armored vehicle in which Italian Consul Guido De Sanctis was riding last Saturday. De Sanctis was not physically harmed by the unidentified gunmen, but the attack was a grim reminder of the murders of the four U.S. diplomats. Italian officials said they would temporarily withdraw foreign staff from their consulate following the attack. “We are considering a force to guard the diplomats, and plans to protect foreign nationals working for foreign companies,” said a source in Libya’s defense ministry who requested anonymity. “It would involve a combination of police and army, but would likely come under the command of the defense ministry,” he said.